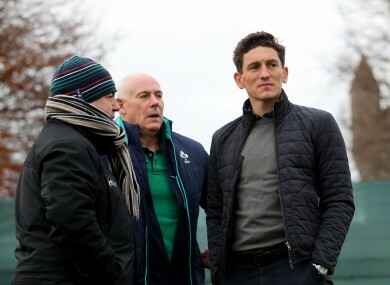 Former Ireland international Keith Andrews watches Ireland Rugby Squad Training at Carton House this week. KEITH ANDREWS IS making no secret of his desire to manage Ireland one day. The recently retired footballer, who earned 35 caps for his country and was a key part of Giovanni Trapattoni’s Euro 2012 squad, is currently coaching at underage level, mainly with Ireland’s U17 side. Having also done some coaching with MK Dons, Andrews says he is currently on what he describes as effectively a “gap year”. “I’m getting around to a lot of sports, whether it’s rugby, cricket, Team Sky before the headlines, just getting around and a little bit of thinking outside the box. When you’re in an industry, you can kind of stay in that bubble. It’s important that you look elsewhere. And what will he be doing during his stint at Carton House? Andrews also says it’s becoming easier for promising young Irish footballers who have been cast aside by big English clubs to stay in the game, largely owing to the recent introduction of U17 and U19 national leagues. When I went away at 15, a lot of our team that didn’t get an opportunity fell out of love with football because the standard wasn’t good. “Half the team had left. They lost hope, they lost enthusiasm for the game. Now there’s more pathways to stay in the game to stay in the game at a very good level with good coaches. “Certainly, the national league is improving as we’ve seen with Dundalk. The gap in years gone by — that jump from 15 to 16 and making it into the national league — is too big. Now with these U17 and U19 national leagues, (the League of Ireland) is certainly a very good option. The Dubliner also believes there’s one essential factor in a young player continuing his development when it can be so easy to lose faith with the sport. I think it’s that ability to deal with failure. A player’s journey (until then) will have been very good, so what happens when they pick up an injury and they’re out for two months? Email “'At 15, a lot of our team that didn't get an opportunity fell out of love with football'”. Feedback on “'At 15, a lot of our team that didn't get an opportunity fell out of love with football'”.